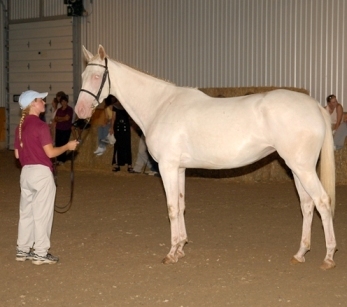 The cream dilution gene has been present in the Thoroughbred breed since the very beginning. 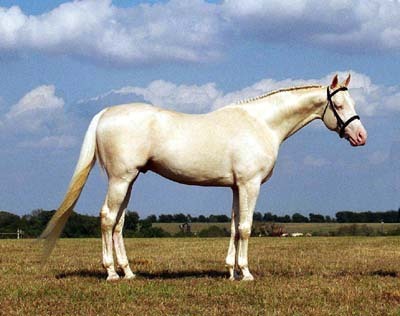 The gene is not found in the Arabian gene pool, so it most likely was introduced through native mares and "Turk" imports (ancestors of the modern Akhal Teke). 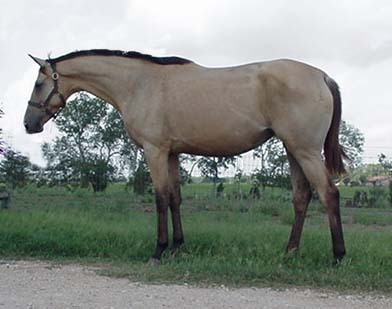 Most buckskin or palomino Thoroughbreds were listed as "dun" in the early stud books, though the portraits made of some of the more famous of these horses clearly show them to be cream dilutes. 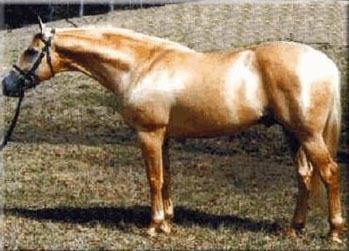 "Dun" was simply a term used at the time to describe the color; it did not have the specific genetic definition that it does now. (Dun, by modern definition, is not present in the TB gene pool.) 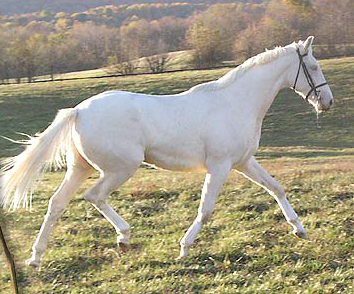 Key progenitors of the early cream lines were Darcy's Yellow Turk, the Oxford Dun Arabian, and the Gower Dun Barb. 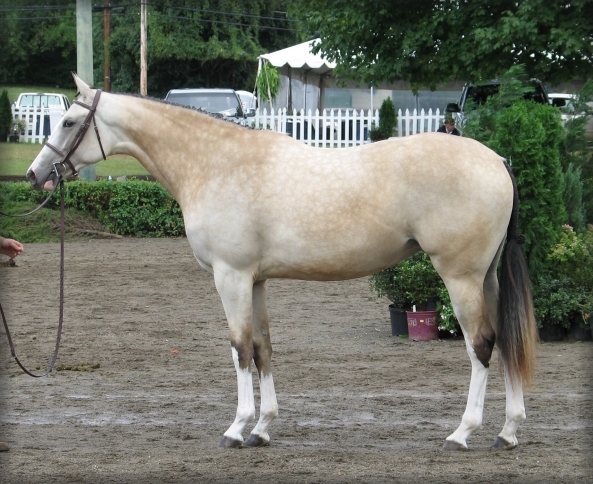 A painting of Brilliant (by Crab out of a daughter of Silverlocks) who is clearly a buckskin. 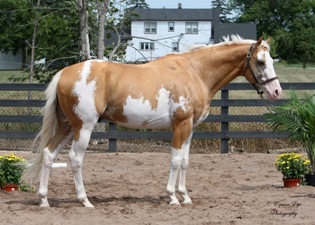 A list of sorts of early cream dilute TBs include: Darcy's Yellow Turk (ca. 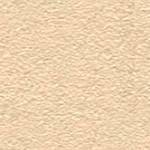 1665, probably palomino), Cream Cheeks (ca. 1690, probably palomino), Morgan's Dun (late 1600s/early 1700s?, buckskin), Thwaite's Dun Mare (early 1700s, buckskin? 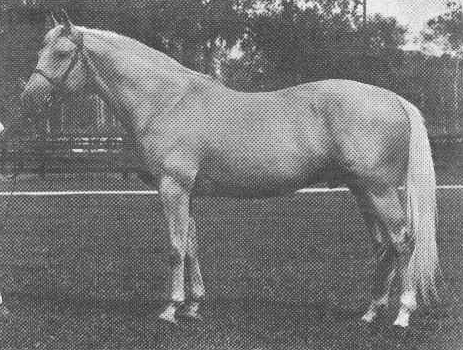 ),Oxford Dun Arabian (ca. 1710, buckskin), Akaster Turk Mare (ca. 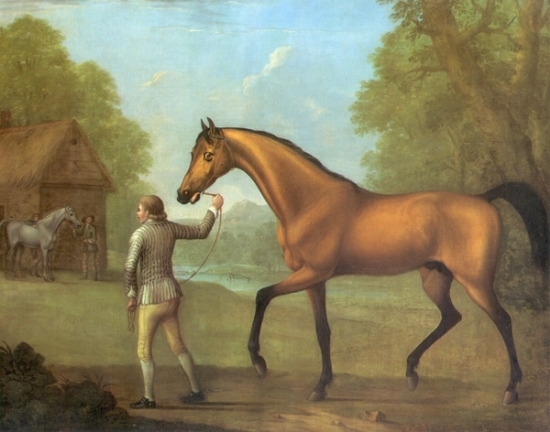 1712, palomino), Oxfird Dun Arabian Mare (ca. 1718, palomino), Silverlocks (1725, probably palomino), Silvertail (1740, probably palomino), Buffcoat (1742, buckskin), Brilliant (1750, buckskin), Ginger (1750, buckskin), Gower Dun Barb (ca. 1750, buckskin), Easby Miller (1751, buckskin), Silvertail (1753, palomino), Creampot (1755, buckskin), Well-Done (1756, buckskin), Doubtful (1759, buckskin), Antelope (1760, buckskin), Honeycomb (1760, buckskin), Isabella (1765, buckskin), Petulant (1767, buckskin), Spindle (1767, buckskin), Dorilas (1768, buckskin), Gem (1768, buckskin), Spangle (1769, buckskin), Dunny (1771, buckskin), Pierrot (1771, buckskin), Custard (1774, buckskin), Loretta (1774, buckskin), Golden Dun (1777, buckskin), Don Dun (mid-late 1700s, ? 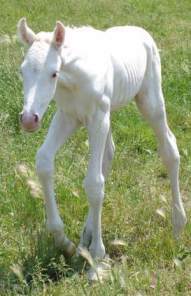 ), and a number of unnamed "dun" foals. After the late-1700s, I can find no references to cream dilute TBs (until the present). 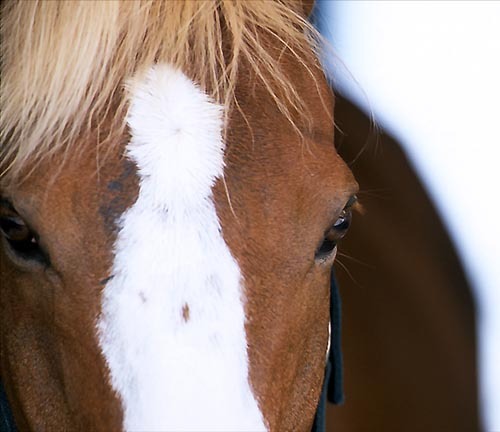 The cream lines either petered out or were misregistered as bays and chestnuts. It is possible that the color survived to the modern day that way, but it seems highly unlikely. You'd think, after all, that at least one golden coated horse might have been mentioned in the intervening 150+ years. 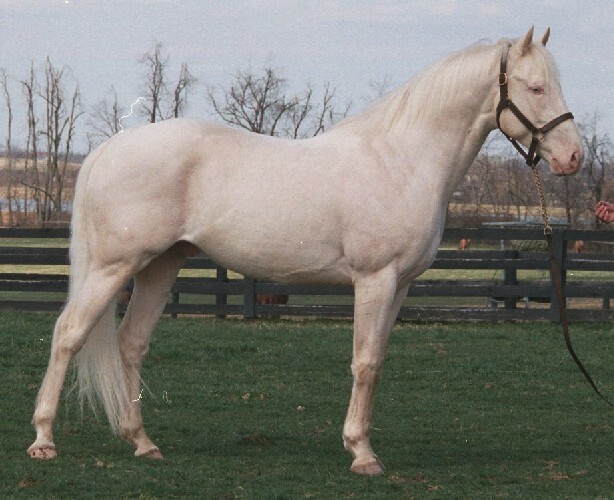 All modern cream dilute Thoroughbreds trace to one of two stallions (and sometimes both), Milkie and Glitter Please. 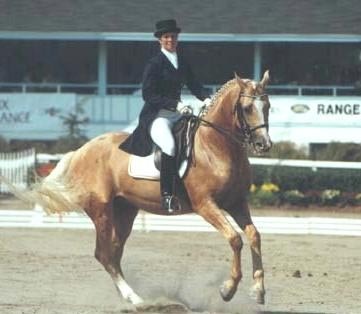 Milkie, born in 1966, was regitered as chestnut, but was indisputably palomino. 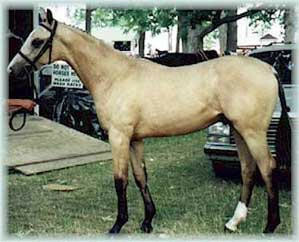 His dam, Tootsie T, was registered as brown, but she may in fact have been a sooty buckskin or smoky black. 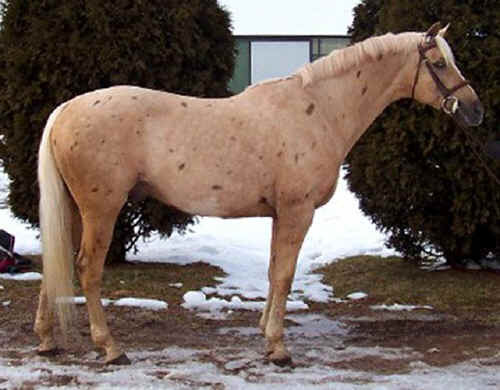 Her family is fairly obscure (and there are lines that trace back to Darcy's Yellow Turk), but it seems more likely that non-Thoroughbred blood bearing the cream gene was introduced at some point, accidentally or otherwise. Milkie in 1972. Even in black and white, it's clear that he is palomino and not chestnut. A few color stills from a video can be seen here on the Gold Hope Farm website. And Milkie's history can be read here. 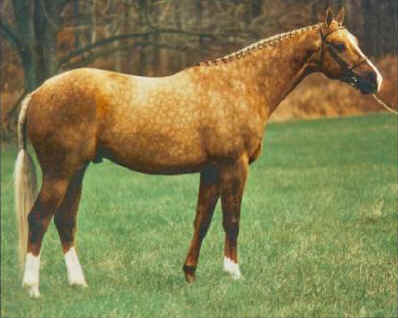 Gold Apollo, probably Milkie's most well-known son, who, like his sire, was a very successful sire of top hunters. 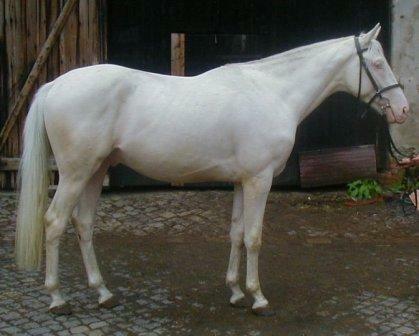 The lovely Glitter Please, a highly accomplished dressage horse. Like Milkie, his descendants excel in a variety of disciplines. 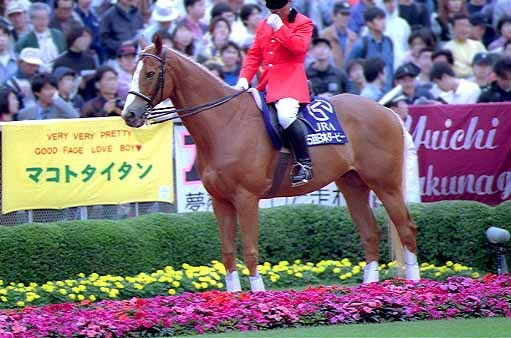 Tosho Falco, a popular Japanese racehorse and later lead pony, looks palomino in this photo. As the photo at left shows, he is in fact flaxen chestnut. Neither of his parents are cream dilutes. 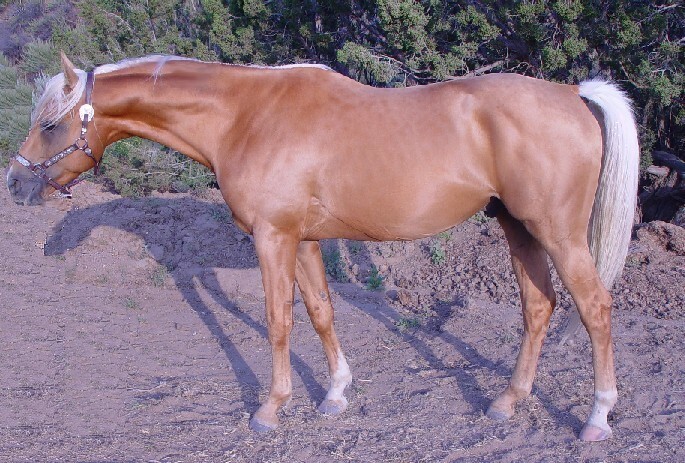 Tosho Falco in retirement. This lovely photo by jinsnap shows that he is truly chestnut.